En Languedoc, on ne nait pas grand vin, on le devient. Driven by the family spirit, the Château de Paraza relives: from the parents to their three children, everyone is involved in hands-on work with the vineyard. Since their first harvest in 2005, the estate has evolved greatly: sustainable agriculture, new grape varieties, new tanks, new press, soon an aging cellar… the goal is set: to express the best from the Languedocian terroir. Minervois is one of the oldest Mediterranean vineyards. 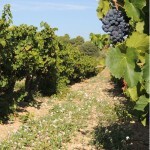 Its soil was indeed chosen by the Romans so as to establish the first vines in Languedoc Roussillon. The castle’s vineyard is located in the Minervois part called “Les Serres”. This soil is essentially characterized by a clay-limestone soil dating from the tertiary period. As wine-growers, we are very concerned by the respect for our environment, for our own health and also to maintain the richness of our soil which the quality of our wines depends on. As a result, we practice a reasoned agriculture, respectful of nature, with many practices similar to the organic approach. Everyday, we take care of our vines and watch its environment and the elements which could impact its growth. We intent to respect our terroir at most and to intervene the least possible, depending on climate conditions, risk of disease, and stage of growth of the vines. We replaced chemical weeding by mechanical weeding. It is followed by deep soil cultivation. We promote biodiversity in our vines : we replant and maintain a pinewood, olive trees and garrigue. In 2017, we have implemented mating disruption to control moth in our 75 hectares of vines. The objective is to limit the use of chemical products. Water treatment. Discharge is processed in compliance with regulations. There is an ongoing search for clean technologies. No chemical product are used to clean the vats and the winery. Water consumption. We control our water consumption. Following the latest drought, in particular in 2016 and 2017, it has become an essential stake. We limit as much as possible our water consumption. In partnership with our suppliers, we have rethought our packaging to reduce our packaging weight and consequently our carbon impact. In this matter, we use packaging from sustainably managed forests (FSC certification), fully recyclable. We assess the impact on the environment of all the actions taken when considering the strategic management of the winery. We have been considering the implementation of solar panels to sustain the power needs of the winery. We hope to implement our project soon.